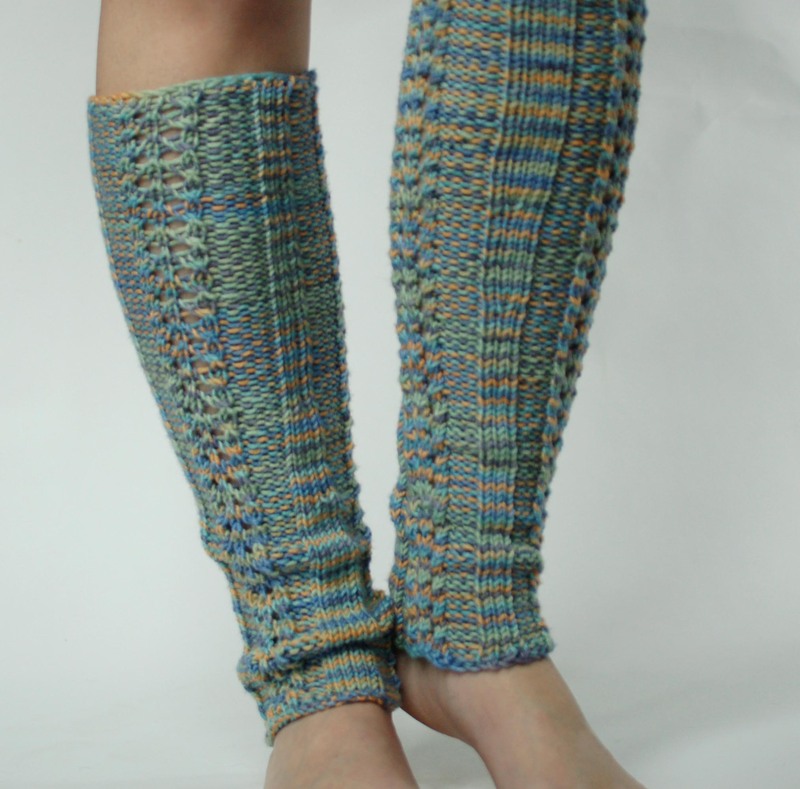 Sizing: These legwarmers fit my 8.5” ankle/13” calf, but the ribbing pulls in a lot and would fit smaller legs. If you add a full repeat, you will add about 4.5” at the widest point (when stretched. again, the ribbing pulls in a lot and will fit smaller) You can also fiddle with the ribbing in between the eyelet sections to get the size you need. If you knit this, I would love feedback. Finish using sewn bind off (see link below) and weaving in ends. April 9, 2010. Tags: free, Knitting, legwarmers, pattern. Knitting, patterns. Thank you for such a nice pattern! I have a question-right at the beginning of the pattern you have rounds 1-3, then round 4 for the lace pattern. You then say, “Repeat these 3 rounds.” I believe you mean repeat these 4 rounds, right? April 15, 2010 at 2:56 am. Permalink. Yes, you’re correct, it should read “repeat these 4 rounds” Thanks for the correction! April 15, 2010 at 3:19 am. Permalink. 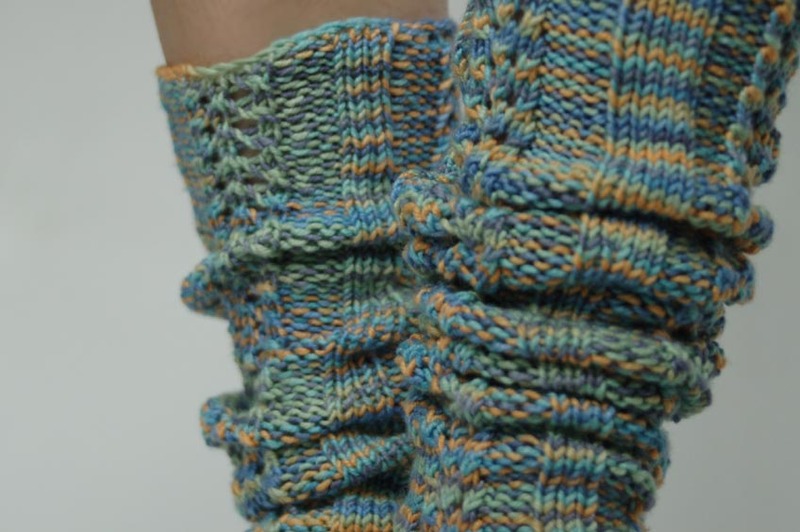 I have made thre pairs of these ribbed leg warmers in the past week . . . 2 in 100% wool and 1 in alpaca/wool blend. The patern is great and fits customers well. One question??? What do you mean by a “sewn cast off” It is a new phrase to me which I cannot find in any of my extensive knitting references or from other experiencd knitters. THANKS AGAIN FOR THE GREAT PATTERN. May 25, 2010 at 10:57 pm. Permalink. May 25, 2010 at 11:17 pm. Permalink. Was wondering how many grams/yards this pattern requires. May 27, 2010 at 7:42 am. Permalink. The skein of yarn I used was 320 yards (142 grams) and I had leftovers. June 11, 2010 at 1:16 pm. Permalink. Hi- I’m looking at patterns to make my daughter legwarmers- these look nice. I know gauge isn’t critical for leg warmers- but it helps me think! Do you have a gauge… i don’t see one noted. and I like the post from the person who made three sets in a week- makes me think I should be able to finish one by Christmas! October 28, 2010 at 12:31 am. Permalink. November 17, 2010 at 8:39 pm. Permalink. I made these leg warmers for my twin nieces and they LOVED them! Since they are 6 and their legs are so thin, I didn’t add any increases. I just continued the same pattern in your initial rounds 1-4. The stretchiness allowed them the have plenty of give without needing the increases in the pattern. Thanks so much!! September 24, 2013 at 3:45 pm. Permalink.